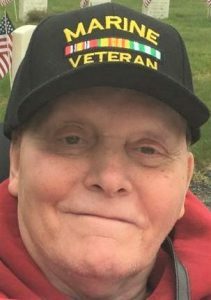 Family & friends are invited to attend visiting hours on Monday, August 27th, from 4:00 p.m. to 8:00 p.m., in the Vertuccio & Smith, Home for Funerals, 773 Broadway (Route 107) REVERE, for Louis J. Liggiero, who died on Thursday, August 23rd, at the Brockton VA Medical Center, where he resided for 19 years with Multiple Sclerosis. His funeral will be conducted from the funeral home on Tuesday, August 28th at 9:30 a.m., followed by a funeral mass in the Immaculate Conception Church (Corner of Beach St. & Winthrop Ave.) REVERE at 10:30 a.m., immediately followed by interment at the Massachusetts National Cemetery of Bourne, Mass. at 2:30 p.m.
Born in Boston, he spent the early years in Wilmington & was a 1962 alumnus of Wilmington High School. He joined the Military in September of 1963 & served in the Marine Corps, while completing the Brigade School as a Company Radio Operator in 1964. He was discharged from the Marines in September of 1967 & continued to serve his country with membership in the Army National Guard & the Air Force National Guard until 1996. In 2000, he entered the Brockton VA Medical Center where he would spend the remainder of his life. His care and treatment in Brockton was excellent. He made numerous friends and took advantage of the many activities that were offered to him. He went on weekly trips with other patients, was part of the bowling team and could be found playing Bingo regularly. He even traveled the country competing in the National Veteran’s Wheelchair games every summer accompanied by his wife and children who cheered him on at each event. Prior to his illness, his chief occupation was as a Self-employed Electronics Engineer, often traveling. He was a former member of the Revere Knights of Columbus, #179 of Revere. He is the beloved husband of nearly 39 years to RoseAnn (Ferro) Liggiero. He is the cherished father of Laurel C. “Lori” Liggiero & her long-time companion, Christopher Scrivano of Tampa, FL, Sharon A. Bruen & her husband, Eric of Ridgecrest, CA, & Darlene M. Closson & her husband, James of Nashua, N.H. He is the devoted grandfather of Briana L. Pizzano of Tampa, FL, Garrett L. Bruen, Grant A. Bruen & Gavin F. Bruen, all of Ridgecrest, CA & Sawyer J. Closson of Nashua, NH. He is the dear brother to Loretta Dankese & her husband, Robert of Billerica, Michael Liggiero & his wife, Carmella of Raymond, NH & the late Josephine Tassone. Monday, August 27th from 4:00 p.m. to 8:00 p.m. In lieu of flowers, remembrances may be made to the Patients Activities Fund at the Brockton VA Medical Center, 940 Belmont St., Brockton, MA 02401. My sweet RoseAnn, My thoughts and prayers are with you and as always, I’m here for you . RIP Lou. God bless you all today and always.